Straight away from her lifetime home. Straight into the unknown. Straight onto the longest bridge in the world — ironic for someone panicky about crossing bridges, but that was how desperate her situation had become. All too soon, however, the “other side” began to seem familiar. Frighteningly familiar. Spotting a Piggly Wiggly store just like the one at home didn’t unsettle her, but seeing the identical twin of their local diner next to it did. An exact replica of Pontchartrain Elementary three blocks away sent her into a cold sweat. Tanya haltingly followed her usual route, dread growing with each well-known landmark. She parked and sat in terrified silence, staring at her house — and Jesse out front, expecting her. Originally published at www.indiesunlimited.com on April 10, 2015. 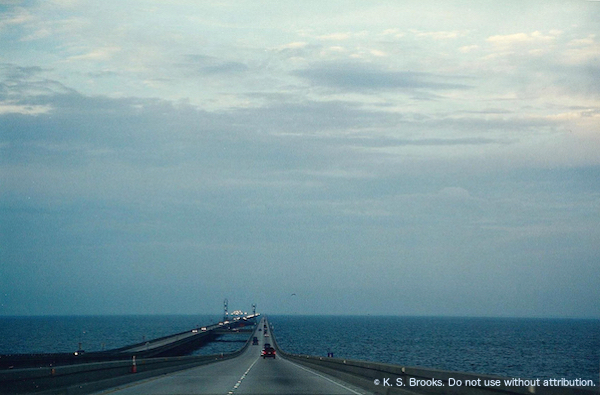 Photo of Lake Pontchartrain © K.S. Brooks. Do not use without attribution.